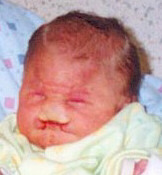 Cleft Advocate - Join the Photo Gallery! By submitting photos and text to cleftAdvocate for publication in the Gallery, you agree to the limited use of the material for these pages and in no way hold cleftAdvocate or its agents responsible for unauthorized use of said materials. If you have any questions, contact debbie@cleftadvocate.org. To be a part of the cleftAdvocate Family Gallery, read our waiver and agreement. Simply follow the sample format below and we'll get your entry published right away. Periodic updates are encouraged, so keep us updated with progress photos and new information! Submit full-size photos and an introductory paragraph to info@cleftadvocate.org! Sydney was born on May 24, 2003 and lived for five glorious days. She spent her time in the arms of Daddy, Mommy, sister, family, and friends. 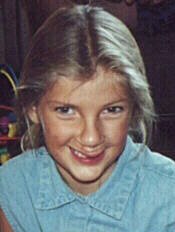 She died May 29, 2003 of Trisomy 13, including cleft lip and palate. of our mission to educate and inspire.